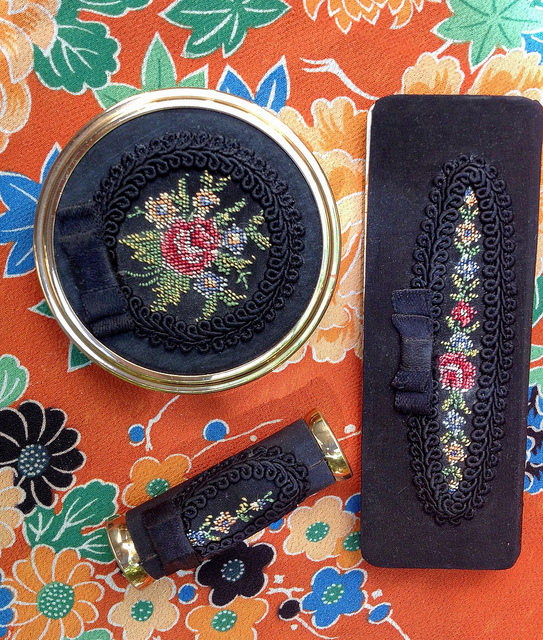 Pretty vintage petit point lipstick case, comb, and compact I found at Vanves flea market earlier this year. Probably from the late 1950s. 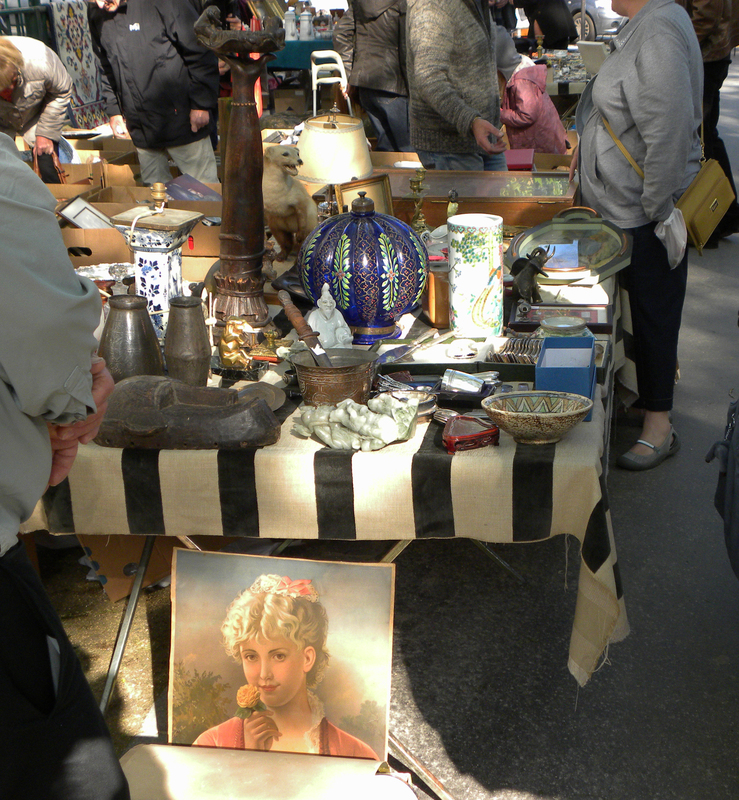 A trip to Paris doesn’t feel complete till I stop by at least one flea market (marché aux puces). 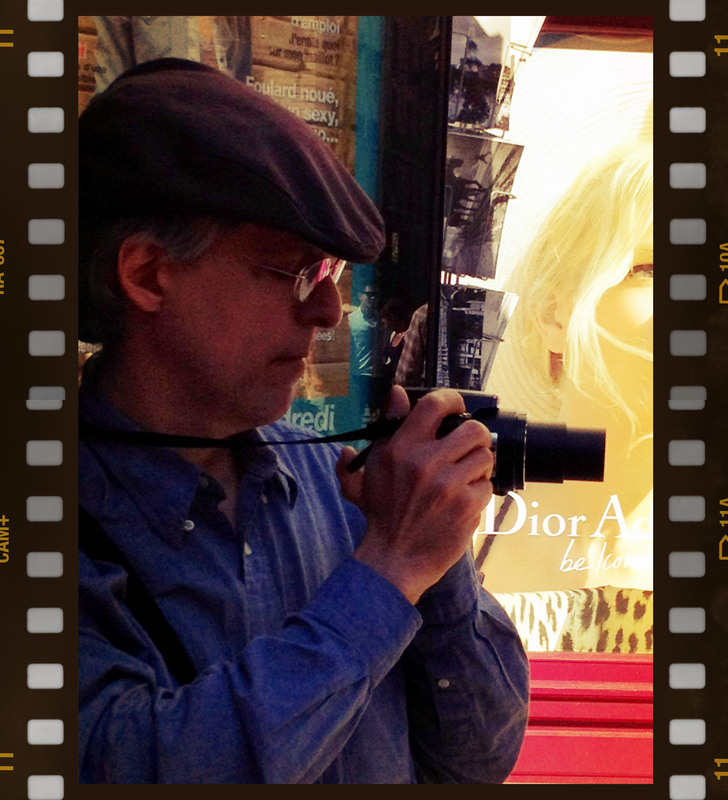 It’s a fun combination of other people’s interesting (or not) stuff, watching Parisian locals socialize with one another, and the thrill of finding something beautiful, interesting, or bizarre. 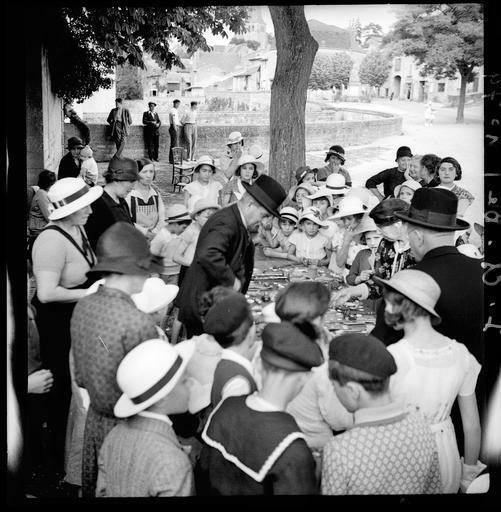 Below are photographs of French flea markets from different eras. 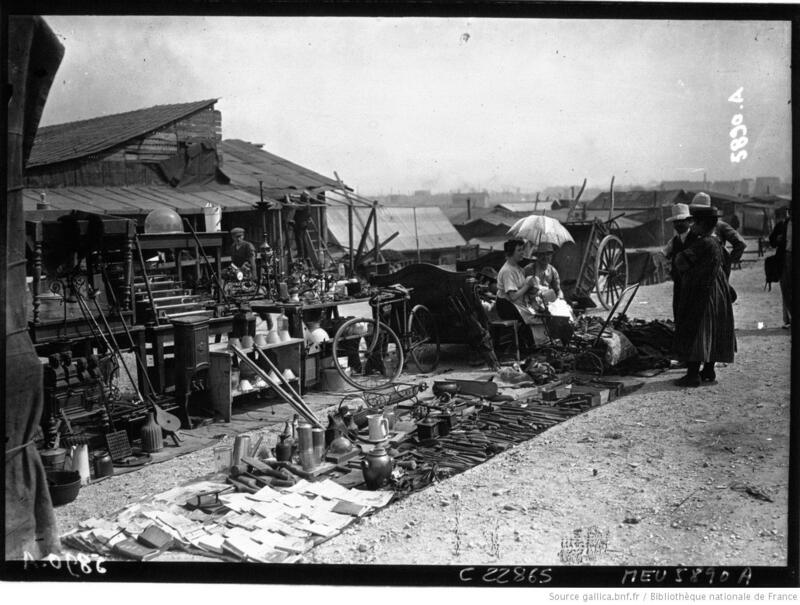 Marché à la ferraille [tableaux, cadres et vieux papiers] : [photographie de presse] / [Agence Rol], 1910. Marche au puces, François Kollar, 1932. Donation François Kollar Ministère de la culture (Médiathèque de l’architecture et du patrimoine) diffusion RMN. 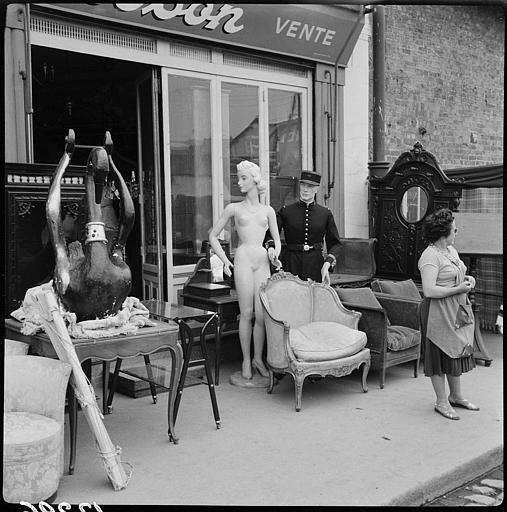 Un coin du Marché aux Puces, le Marché Biron, Noël Le Boyer, 1940. Ministère de la culture (France), Médiathèque de l’architecture et du patrimoine, diffusion RMN. 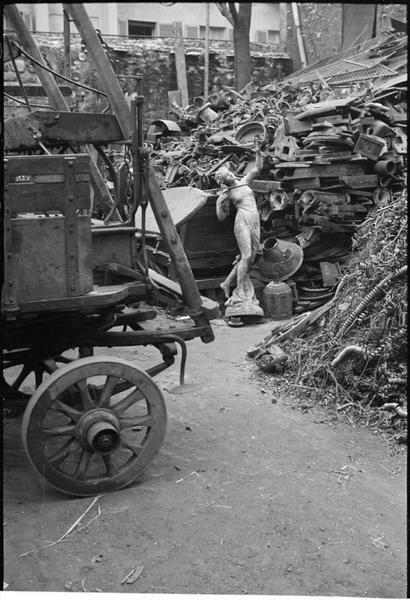 L’incorrigible ; [Sculpture au marché aux puces], 1930, André Kertész. Donation André Kertész, Ministère de la culture (Médiathèque de l’architecture et du patrimoine), diffusion RMN. 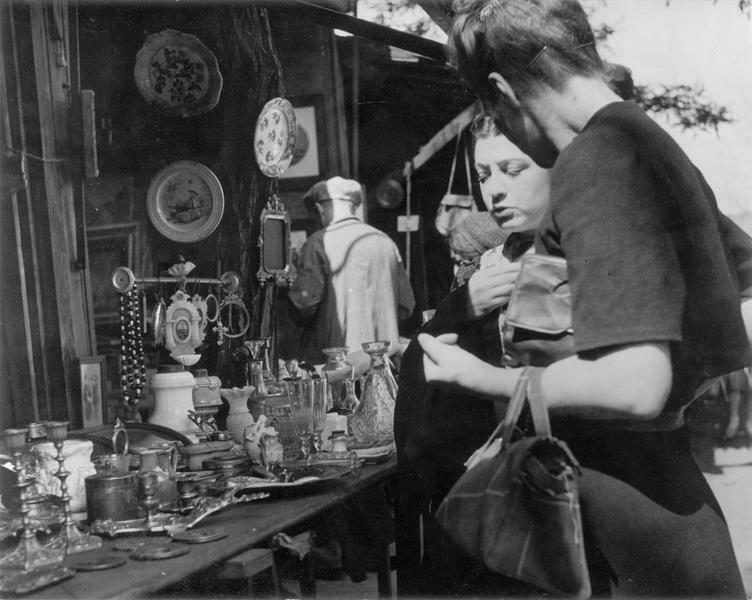 Marché aux puces, deux femmes devant le stand d’un brocanteur, Noël Le Boyer,1940. Photo from Ministère de la culture (France), Médiathèque de l’architecture et du patrimoine. 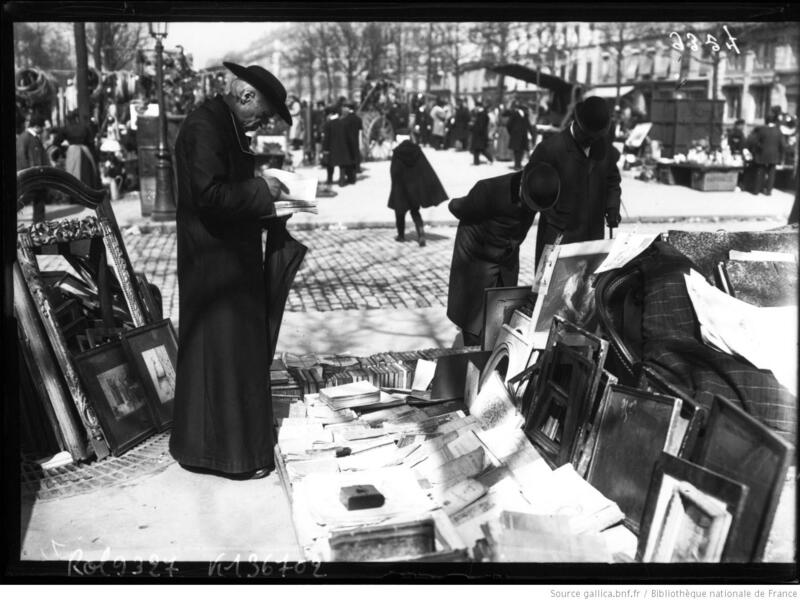 La Foire aux Puces de la Porte de Clignancourt : [photographie de presse] / Agence Meurisse, 1923. Photo from Bibliothèque nationale de France. 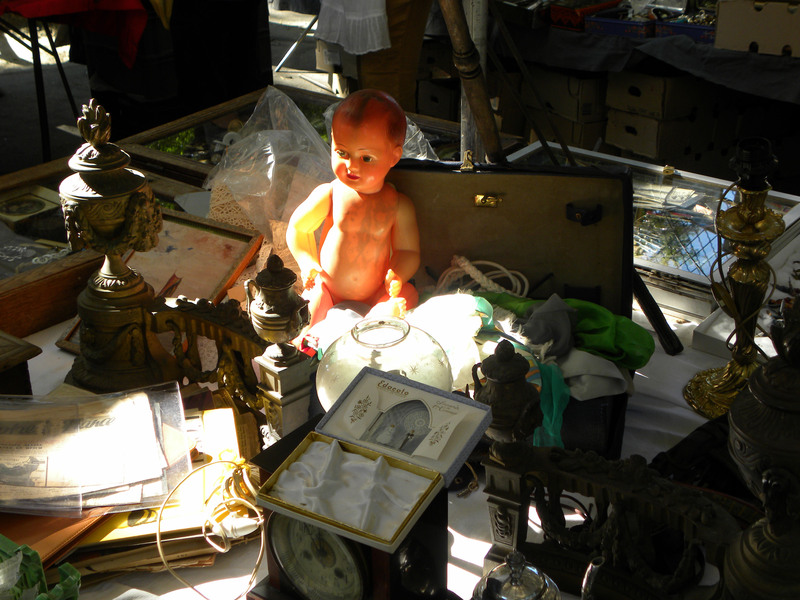 I’m fascinated by flea markets in Europe. 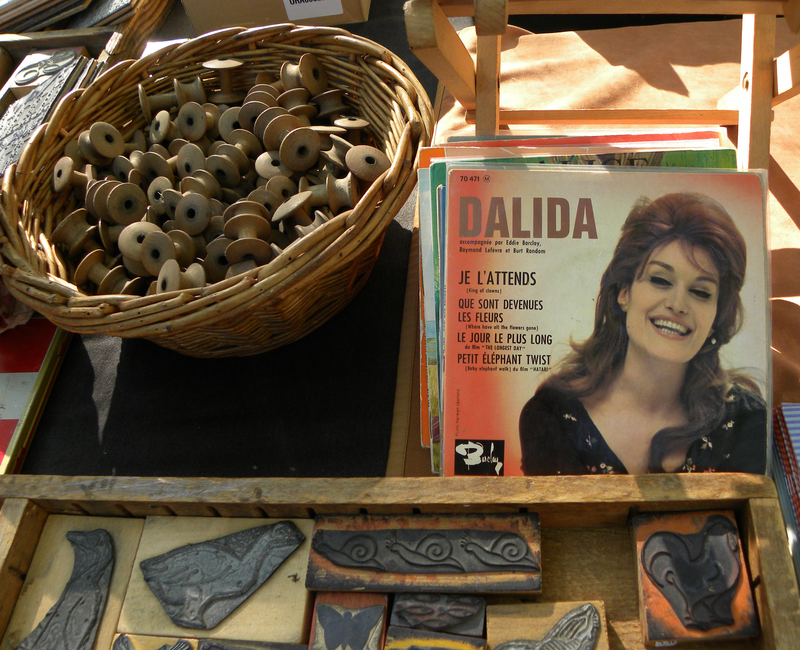 I prefer the traditional ones where you might find a mix of bric-a-brac, paintings, vintage jewelry, silverware, old books, pieces of lace, old pots and pans, and records. 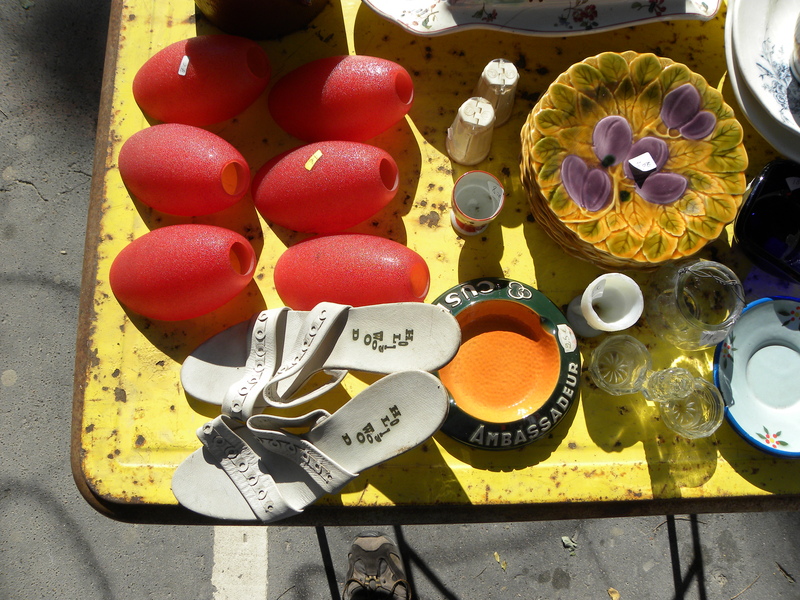 I don’t like the noisy ones with plastic battery-operated junk – I can see that kind of flea market any weekend here in the U.S.
One reason I find used goods fascinating is the history that goes along with an item. I like to daydream about who owned it originally and how the item was used. 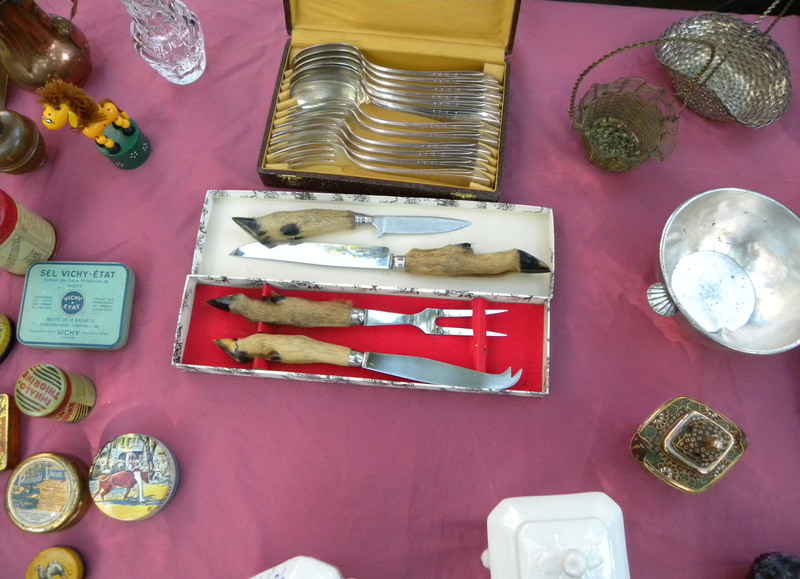 Did that set of silverware belong to a just married couple before the war? Who is that pretty girl in the painting? When were those dolls made? The book Flea Markets in Europe describes why some people buy second-hand goods at flea market – “the desire to be different, to possess those articles which are no longer made, aand which few people still have…which do not show the marks of mass production and which outlive both fashion and their owners.” I think many of the visitor to the Vanves flea market fall into this category. 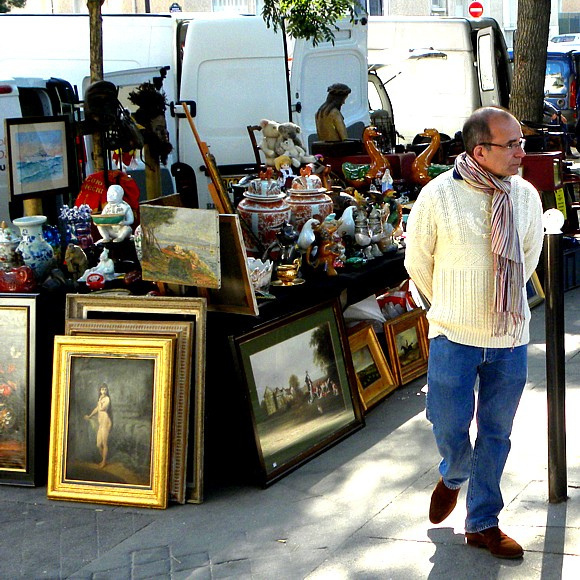 The people watching is great at le marché aux puces. The sellers know each other and banter about and watch each other’s stalls if they have to go get lunch. 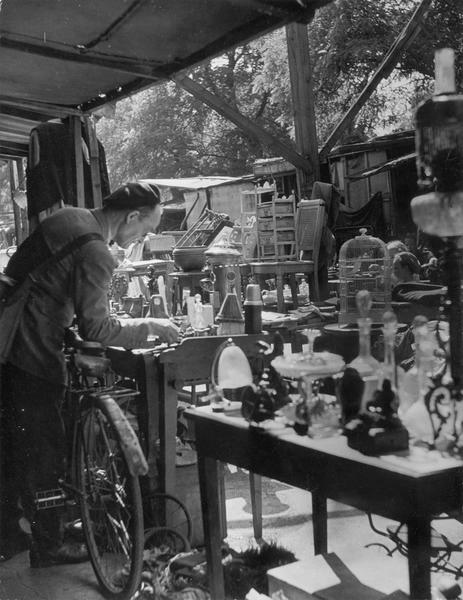 Many of them are very knowledgeable about what they’re selling though there is a subgroup of slightly rough-hewn types that descend straight from the rag and bone pickers of old. 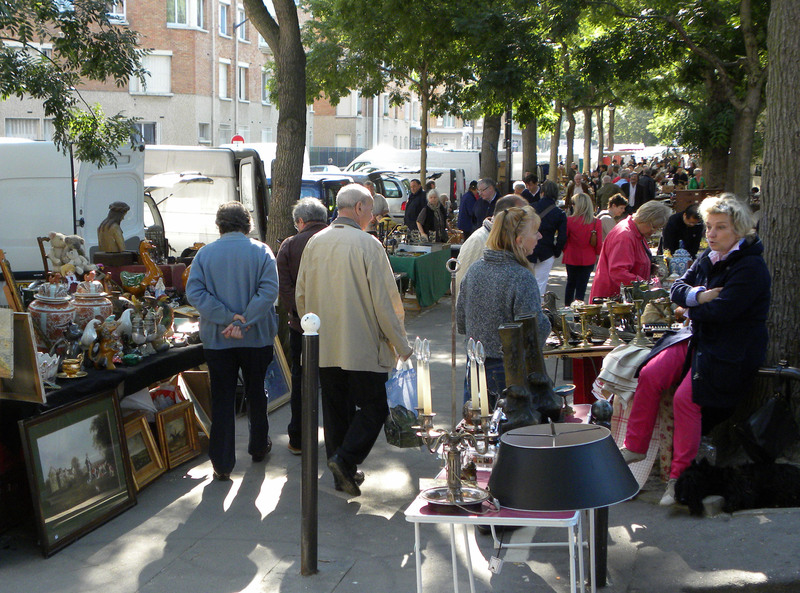 At Vanves, many of the customers are local Parisians as well as tourists from all over the world exploring the wares. Of course one must eat after a morning of looking at interesting objects. 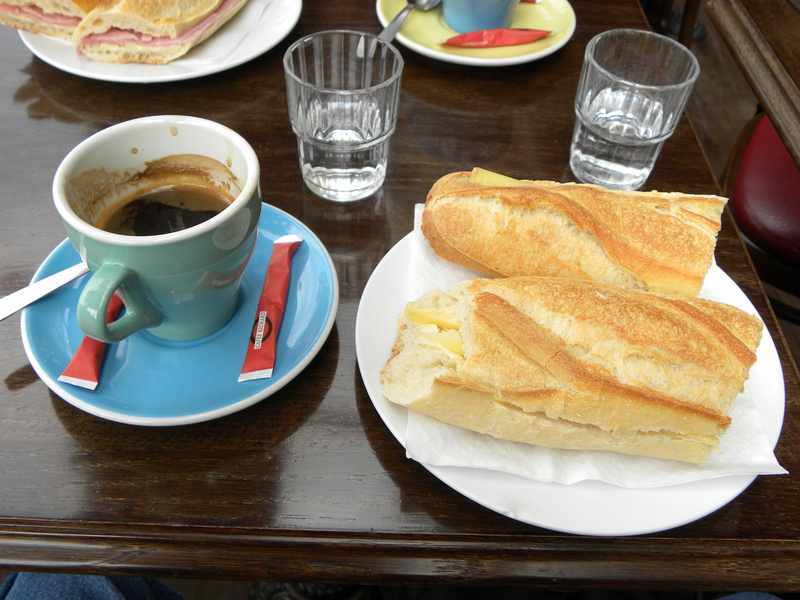 A small cheese sandwich and a coffee at a local cafe rounded out this expedition. 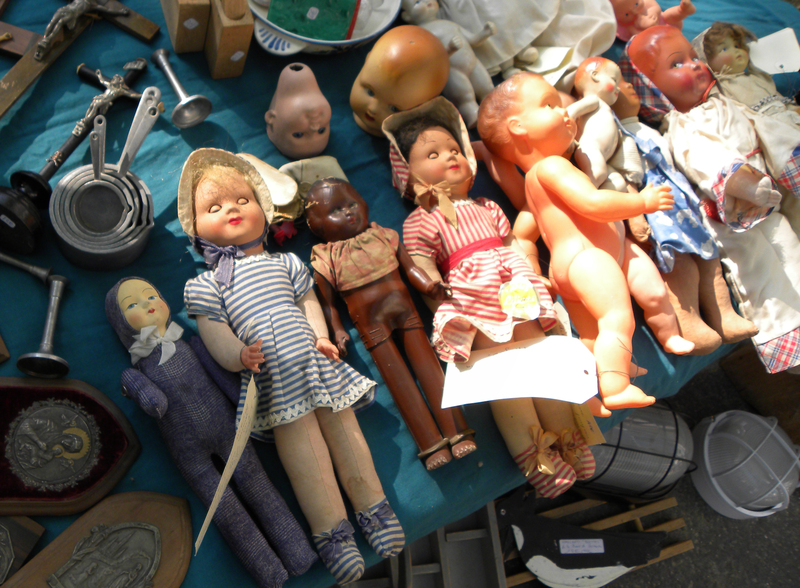 Do you buy second-hand items or do you find used stuff gross? 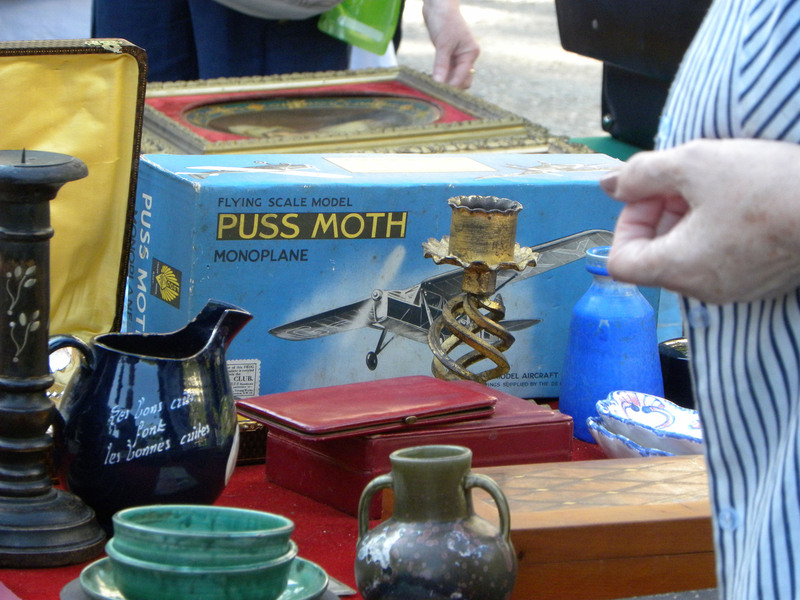 What’s your favorite flea market? 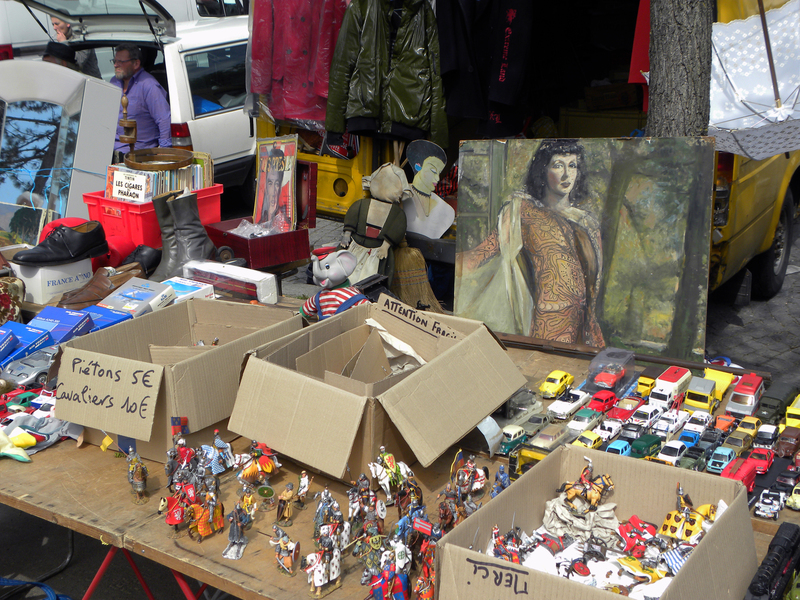 One of the highlights of my trip to Paris was a visit to the Vanves flea market (le Marché aux Puces de la Porte de Vanves) in the 14th arrondisement. 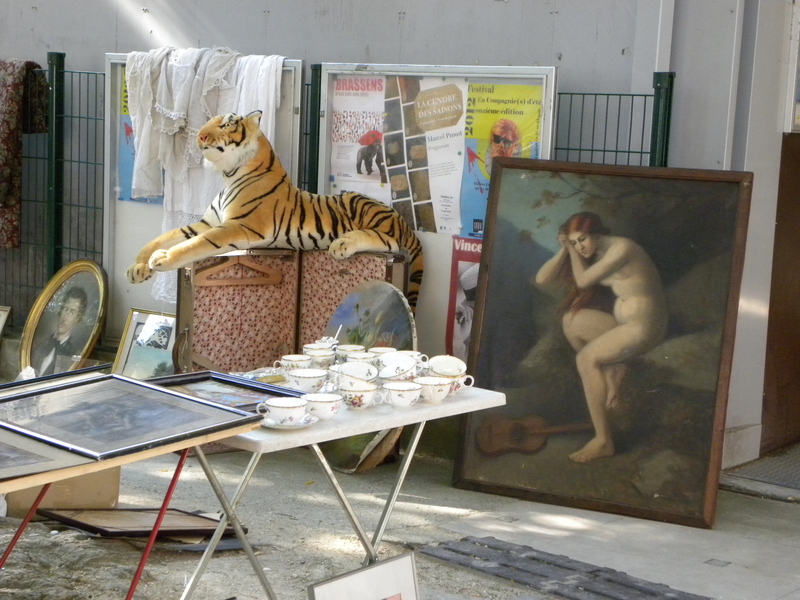 The variety of neat old stuff, interesting Parisians, and bad 70s art made for a very entertaining and enjoyable morning. My husband is the photographer in the family, and he’s agreed to let me use his photographs from our flea market outing on my blog. Merci beacoup! What, you may be wondering, did I find? 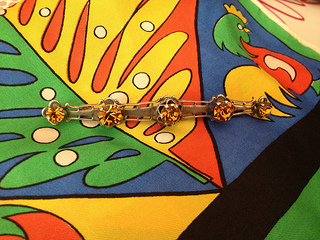 I bought a beautiful old brooch and a colorful silk scarf. I was inspired to buy the scarf after seeing a chic Parisian woman with a bright Hermes scarf around her neck.